Does Your State Matter? It did at the GLCEC! On October 6th and 7th, 2016, the Radisson Plaza Hotel in Kalamazoo, MI played host to the Great Lakes Christian Educators’ Convention. The Michigan, Ohio, Indiana, Illinois, Wisconsin, and Minnesota state associations converged with much excitement to refresh educators’ spiritual purpose and professional skill in the great calling of Christian education. Close to 950 attendees from 84 Christian schools selected from 120 sessions offered by nearly 50 presenters while visiting over 75 vendors. To say the place was busy would be the understatement of the year! Responses from attendees were overwhelmingly positive, and exit survey data indicated a strong sense of satisfaction with the conference setting, sessions, and speakers. However, the data collected from exit surveys also revealed an interesting trend: The state that attendees hailed from had a connection to the sessions they attended. 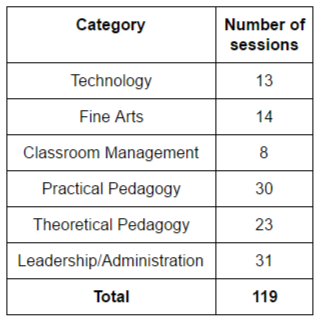 The next step in this analysis was to categorize the conference sessions. The conference schedule allowed for 17 unique sessions to be offered during seven breakout times–four on Thursday and three on Friday–giving attendees 119 choices of sessions. The session titles and descriptions were evaluated, and six general themes appeared: Technology, Fine Arts, Classroom Management, Practical Pedagogy, Theoretical Pedagogy, and Leadership. Finally, I conducted a Chi Square statistical test to determine if there was a significant difference between attendees’ home state and their choice of sessions. In other words, did the state a teacher was from have anything to do with his or her choice of what sessions to attend? For example, given the choice of six types of presentations, were teachers from Michigan more likely to choose Technology sessions than were teachers from Wisconsin? We could also ask whether Ohio teachers were more likely to attend Classroom Management sessions than Fine Arts sessions, given the six session options. It would be useful to know this information so that future conferences, both state and regional, could be planned with teacher interests in mind. Were males more likely to attend a certain type of session than females? Did attendees from any certain state rate the conference more positively than attendees from other states? The Chi Square statistic is pretty simple to understand. Essentially, the stat asks whether observed values were greatly different from expected values. Did more people actually attend a certain type of session than would have been mathematically expected? For instance, if there were 100 people at a conference and five sessions were offered, we would mathematically expect there to be about 20 people at each session. Simple division. However, expected values involve division but with a formula that takes into consideration the preexisting differences in the categories. 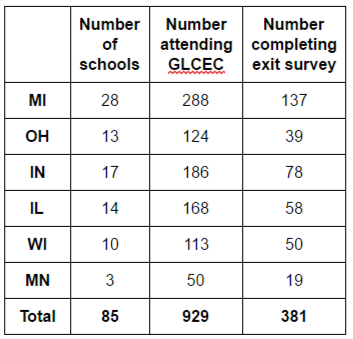 For example, on the GLCEC exit survey data, there were far more respondees from Michigan (137) than from Ohio (39). Therefore, the Chi Square takes into account that it would be expected to have more Michiganders choosing, say Leadership/Administration sessions, than Ohioans. After all, there were more people from Michigan who both attended the conference and who also completed the survey. Therefore, the number of Michigan teachers choosing Leadership/Administration would have to be really high before it would be considered significant. Finally, what do we mean by “significant”? The easiest explanation here is simply to say that the observed value is so different from the expected value that there is no way it happened just by chance. Going back to a simpler example: 100 teachers with five options for sessions. We expect about 20 at each. However, if it turns out that there were actually ten teachers at four sessions and 60 at the fifth session, that’s enough to make someone scratch their head and wonder why that happened. Was it because of the presenter? Was it due to the type of session? Was it because the attendees all had something in common? Was it because the fifth session offered coffee and doughnuts? The “why” is sometimes open to interpretation unless there is a clear and obvious reason why the difference should be expected. The state that teachers are from might be one. Gender could be another. Free doughnuts? Definitely. Technology: More teachers from Illinois (54/38)* attended Technology sessions than expected, while fewer teachers from Wisconsin (24/36) and Minnesota (6/14) attended than expected. Fine Arts: More teachers from Illinois (54/35) attended Fine Arts sessions than expected, while fewer teachers from Indiana (29/48) attended than expected. Classroom Management: More teachers from Indiana (95/71) attended Classroom Management sessions than expected. Practical Pedagogy: More teachers from Wisconsin (127/103) attended Practical Pedagogy sessions than expected, while fewer teachers from Indiana (123/151) attended than expected. 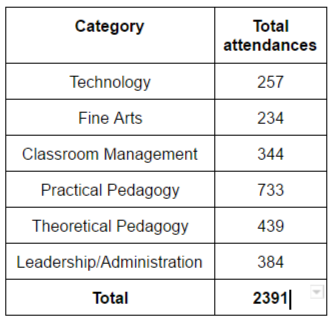 Theoretical Pedagogy: More teachers from Indiana (112/91) attended Theoretical Pedagogy sessions than expected. 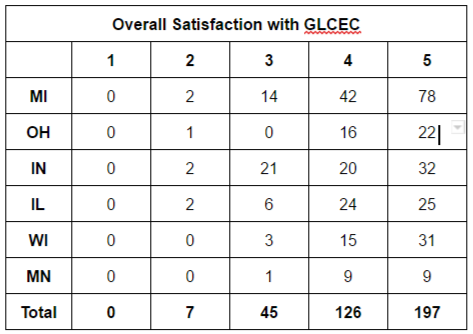 Leadership: More teachers from Michigan (161/134) attended Leadership/Administration sessions than expected, while fewer teachers from Wisconsin (34/54) attended than expected. 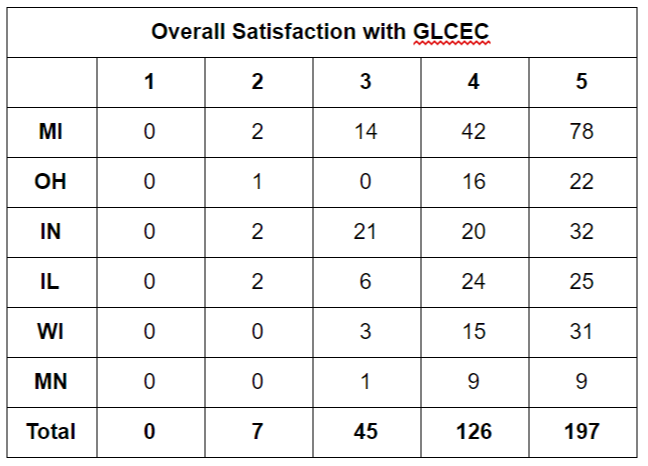 There was one significant result from this analysis: More attendees from Indiana (21/9) rated the conference lower than expected. We must keep in mind when drawing conclusions based on this data that there are many known unknowns. We don’t know what influenced teachers to choose the sessions they chose. We don’t know if certain presenters drew larger crowds than others. We don’t know if teachers had it to do over if they would choose different sessions. However, we do know that there was a statistically significant connection between where teachers were from and what sessions they chose. In the mean time, feel free to leave a comment as to why you think this connection existed. Your thoughts and speculations are welcome.